Pennsylvania is expected to be one of the 10 states responsible for half of all new nursing positions added across the nation by 2022, creating a vibrant atmosphere for new and current nurses alike. It’s an exciting time to be a nurse in Pennsylvania, and many prospective students may be wondering what it takes to enter the field. Keep reading to find state-approved nursing schools and programs in Pennsylvania, as well as learn more about state licensure procedures and salary outlook. There are several board-approved nursing programs in Pennsylvania. These programs offer rigorous training via a range of degree options for aspiring nurses looking to enter the field as an entry-level RN as well as for those looking to further your education and move in to more advanced, leadership roles. 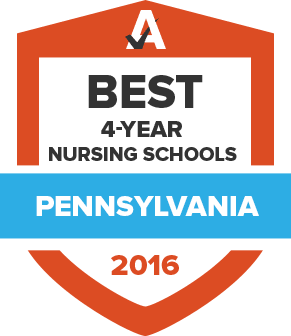 Use the search tool below to explore viable options for nursing schools in Pennsylvania and get a side-by-side comparison of your top selections. The Pennsylvania State Board of Nursing is tasked with regulating nursing education and the licensure process for all nurses within the state. The Board is also responsible for fielding complaints and renewing nursing licenses. Recent nursing school graduates looking for employment in Pennsylvania can find details on how to obtain a state license below. All applicants, examination and endorsement, are required to complete a 3-hour DHS-approved training on how to properly identify and report child abuse. Once this course has been completed, the approved provider will notify the Board electronically. This can take up to seven business days, and a license will not be issued until verification is received. If holding a license in another state, jurisdiction or country, the applicant will need to complete an endorsement application. Graduates of non-English programs are required to take and pass a Board-approved exam to prove English proficiency. Pennsylvania nurses in good standing must renew their licenses biennially. During the interim years, nurses are required to complete 30 hours of continuing education credits in areas relevant to patient care, professional nursing or a specialty area. The Board may provide special approval for courses that do not fit within general requirements for CE if consent is requested. When submitting a renewal application, registered nurses must include a $65 processing fee. Applicants who received their education and degree from an out-of-state nursing school must send official transcripts from the school’s registrar directly to the Pennsylvania State Board of Nursing. Official transcripts must indicate the type of degree or certificate earned, as well as the month, date, and year the program was successfully completed. More detailed information about advanced practice nursing, including step-by-step instructions, forms, and details regarding license renewals can be found at the PA State Board of Nursing. Pennsylvania ranks in the top 10 states for highest concentration of nurses per capita, with the annual mean wage sitting close to the national average. However, depending on whether or not a nurse works in a rural or urban area, their salary could be much higher or lower than the state’s average. Take a look at the numbers below for an idea of what RNs in Pennsylvania earn and how employment looks for the upcoming decade. Founded in 2009, this union and professional association of registered nurses promotes effective bargaining representation and expands the voice of direct care RNs in public policy. This professional organization for nursing administrators in Pennsylvania promotes collaboration among practical nursing administrators, educators and organizations concerned with the delivery of health care. PASNP is a professional organization of school nurses in Pennsylvania, which aims to provide continuing education, improve political awareness, and promote school nursing. The Pennsylvania Coalition of Nurse Practitioners is a state-level organization that promotes the interests and careers of certified registered nurse practitioners. It has 18 regional offices across the commonwealth. The PSNA is a professional organization in the Commonwealth of Pennsylvania that advocates for nurses on the state level, backs nursing and health care legislative reform, and provides networking and continuing education opportunities for nurses in the state. The Board’s mission is to protect the health and safety of Pennsylvania residents by regulating the practice and licensure/certification process of registered nurses, practical nurses, certified registered nurse practitioners, clinical nurse specialists, dietician-nutritionists, and graduate nurses. Current and aspiring nurses can find information on licenses and certifications and other important notices and updates relevant to the field.